Bookended with transits of the Kiel Canal, this spring cruise from Tilbury features a collection of rarely visited Baltic ports. 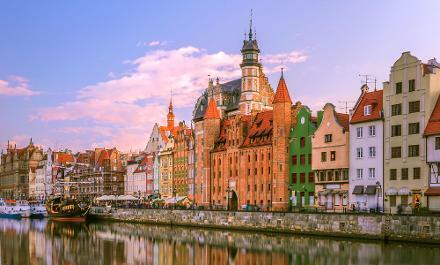 Cruise to stunning Wismar, the picture-book islands of Bornholm and Gotland, Lithuanian Klaipeda and the great Polish maritime city of Gdansk. Beautiful, 550-passenger Astoria is every inch the perfect cruise vessel. Originally a transatlantic liner, now restored and lovingly maintained as a premium-rated cruise ship, Astoria is both small enough to offer a friendly atmosphere, and large enough to offer a relaxed environment to ensure your holiday enjoyment. She's every inch the perfect home from home for your memorable cruise holiday. Click here to display the deck-plans for this cruise. There's far more to life on board Astoria than we could possibly fit on one page. Click here to find out more about her fantastic facilities and welcoming atmosphere. The greatest pleasure of a cruise holiday is the knowledge that as each day dawns, there'll be a new adventure to enjoy, a new experience to savour. N.B. All days not listed are spent at sea enjoying the excellent facilities aboard Astoria. Please see the Full Itinerary for details. Ports marked with an asterisk will be reached by landing boat and may be inaccessible for customers with mobility difficulties. Make your way to Tilbury for embarkation and Astoria's afternoon sailing. Today is spent at sea before Astoria arrives in Brunsbuttel, early this evening, to begin her transit of the Kiel Canal. Astoria's rare call in Germany's Wismar brings an opportunity to discover this stunning, UNESCO-listed former Hanseatic port-city. See the beautifully restored altstadt (old town), vast Markt square and towering, red-brick Gothic cathedral. Wander streets lined with beautiful gabled buildings and look out for the Swedish Heads - colourful, moustachioed busts dotted around the city that reflect the city's 17th-century annexation by its northern neighbour. The Danish island of Bornholm is a hugely popular destination for Scandinavian visitors. Discover the half-timbered and newer brick-built houses, and St Torv market place of the pretty port-town of Ronne. Visit the fascinating museum that showcases the island's history of grandfather-clock-making, or perhaps head into the countryside or beaches beyond. Astoria's second Baltic island call is to Swedish Gotland. The island's UNESCO-listed capital, Visby, is a medieval treasure trove of wooden cottages, cobbled streets and Gothic churches, encompassed by stout defensive walls. Beyond the town, a pristine land of tranquil countryside and fine beaches dotted with fascinating weathered rock formations known as 'rauks', awaits. The once-secretive port of Klaipeda, Lithuania's third-largest city, boasts an unspoilt old town of half-timbered houses, cafes and gift shops. Choose to venture further afield and you might see the vast sand dunes of the Curonian Spit National Park, or fascinating Zemaitija National Park (home to a once top-secret Cold War missile base and beautiful Lake Plateliai). The historic port city of Gdynia, once the mightiest in Poland, welcomes Astoria this morning. Part of the 'Tri-City', alongside elegant Sopot and fabled Gdansk, Gdynia is set on the picturesque Bay of Gdansk, and provides the opportunity for some wonderful optional shore excursions. Today is spent at sea, hopefully enjoying sunny skies, before Astoria arrives in Holtenau to begin her late afternoon transit of the famous Kiel Canal. Shortly after midnight, Astoria will complete her passage back through the Kiel Canal to Brunsbuttel. The rest of the day is spent at sea, relaxing and reliving the adventures of your Baltic islands cruise. Arrive in Tilbury, and bid farewell to the crew and your fellow travellers as you disembark this morning. *These offers apply to new bookings made between 1st August and 31st October 2017 (inclusive) only. The price shown on this page includes any initial Saver Fare discount, but not the Buy One, Get One Half-Price discount. The exact value of the discount included will vary depending on offer, cruise, cabin and departure date selected. Discounts apply to all cabin categories. 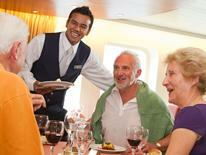 On cruises with a Buy One, Get One Half-Price offer, single cabin full fares will be discounted by 25 per cent. On cruises with a Buy One, Get One Free offer, single cabin full fares will be discounted by 50 per cent. These offers may be withdrawn at any time. All fares exclude gratuities. On many of our cruises, a limited number of Voyager Fare Inner and Ocean-view cabins are available. Choose these and you will be accommodated in at least a Standard Twin Inner or Ocean-view cabin, but will pay only the reduced Voyager Fare price. Availability is limited, so book now to secure your discount.